Roger Kube from Surfrider Foundation has a Presentation on Plastic Bag Band, Restaurants Campaign and Water Conservation. The meeting is Wednesday, April 22nd, and is held at the Masonic Center at1711 Sunset Cliffs Blvd. It starts at 7 pm. There will also be the usual round of presentations by local leaders, political, business and SDPD law enforcement, fire department representatives. The Council urges all OBceans to attend, whether you’re a long-time OBcean or just want to learn more about OB, all are welcome! 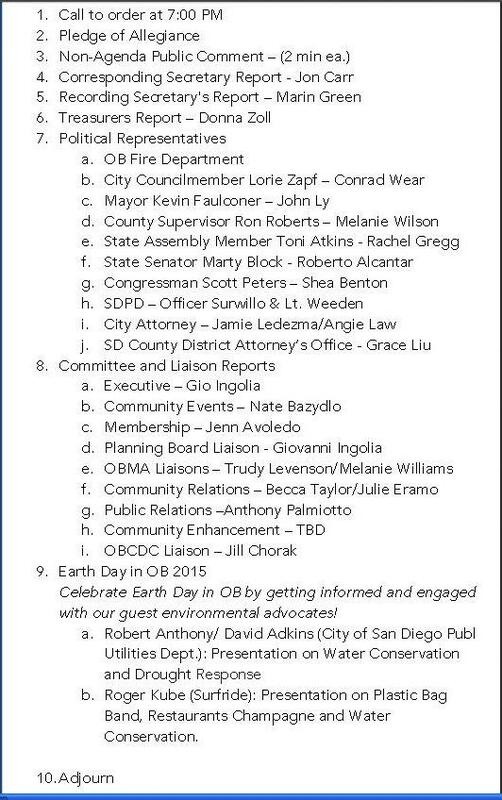 At this month’s meeting of the Ocean Beach Town Council, we’ll be joined by these guest environmental advocates! Roger Kube (Surfrider): Presentation on Plastic Bag Ban, Restaurants Campaign and Water Conservation. Hey Gretchen and Jon C – you guys were missed. My report on the meeting will be forthcoming – probably Friday. You know, when you go to the apres-meeting brewery and stay till 10-ish, how can you expect a report this next morning, I ask you?